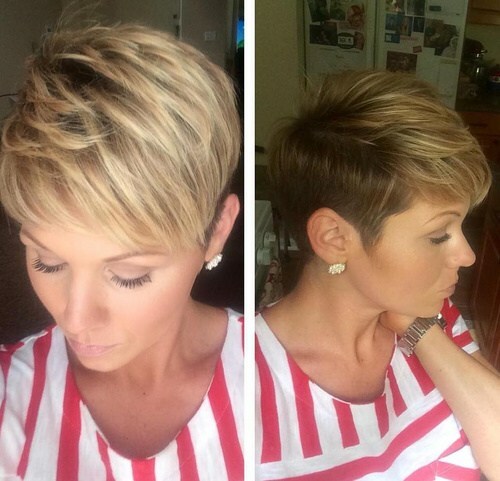 Opting for short hair is the most gorgeous and stylish way to show off your stunning facial features. 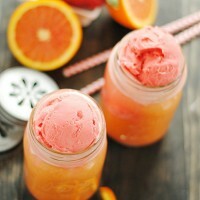 Chopping your hair off can be a bold move – especially if you’re used to long locks that you can play around with. 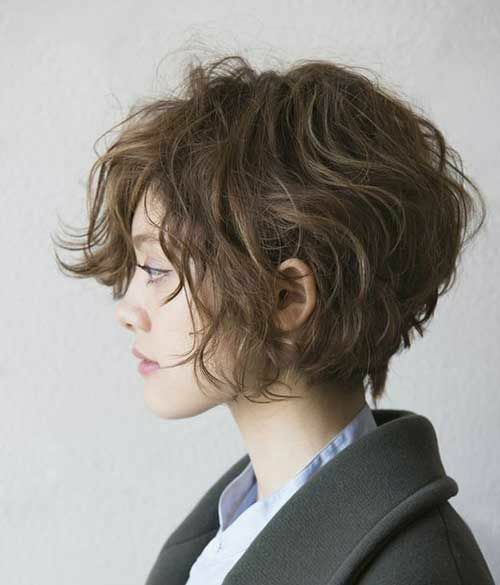 Having said this, trust us when we say short hair can be equally versatile, and every inch as stylish as longer hair! We’ve gathered some of our favorite pretty short haircuts for women to inspire you to try something new with yours. This stunning lady has a beautiful face with a gorgeous smattering of freckles that deserve to be showed off – which is exactly what she’s done with this wonderful asymmetrical caramel pixie crop. It’s shorter on one side and then falls into a beautiful side fringe that frames the face. 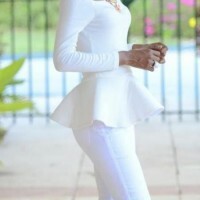 The top is curled up to add bounce and body, which looks simply gorgeous. If you’re going to change your hair, why not do something really dramatic and change both the colour and the style? 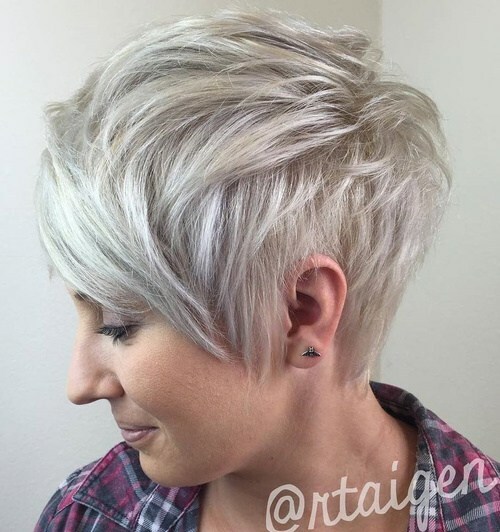 Silver is such an on-trend colour this season, and this gorgeous woman has opted for a light silver sweeping bob that looks like it could be in a fashion magazine! This beautiful bob is finished with a fabulous side fringe that frames the face. 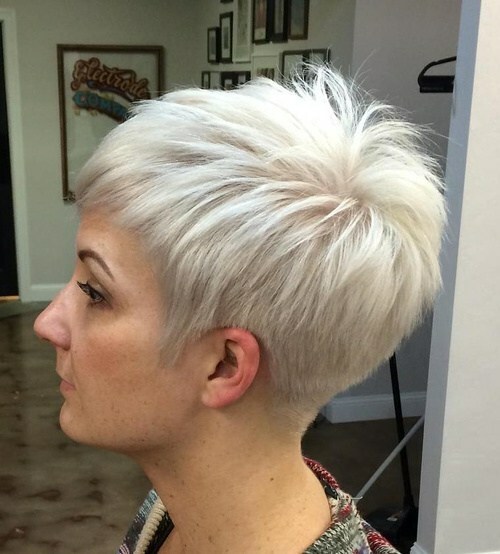 This lady’s stunning short hair is designed to attract attention – and she does so perfectly by drawing all eyes to her thanks to the gorgeous cut and colour. This wonderful bob is full of short and choppy layers to create a fabulous finish, which is slightly longer towards the front and shorter at the back. We just love this look – don’t you? This lady has cropped her gorgeous black hair into the most beautiful graduated bob, and finished with a remarkable spattering of red highlights throughout, starting from the root and finishing at the tip! 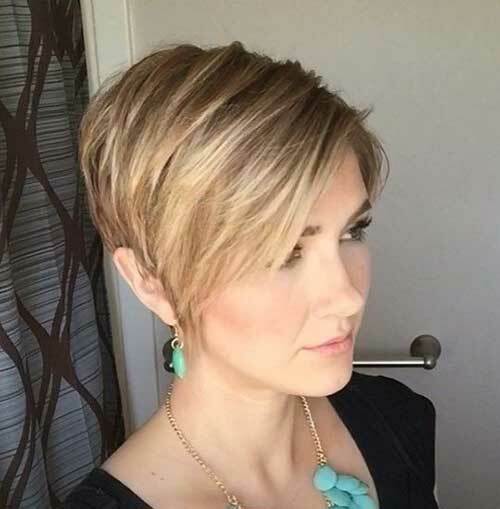 This wonderful bob cut falls longer at the front of the face and is cut in a graduated style until it’s shorter at the back in a lovely asymmetrical line. 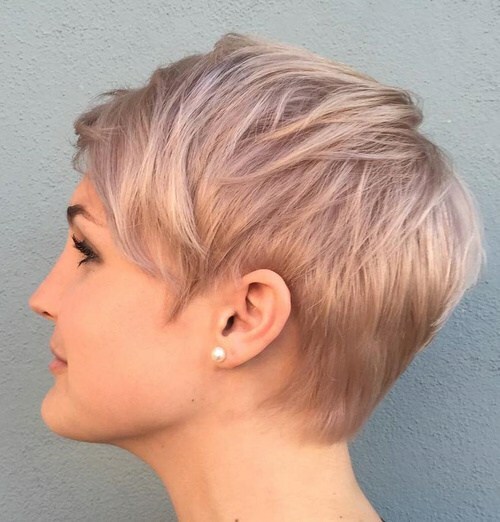 Why choose one beautiful colour for your pixie cut when you can work with two? 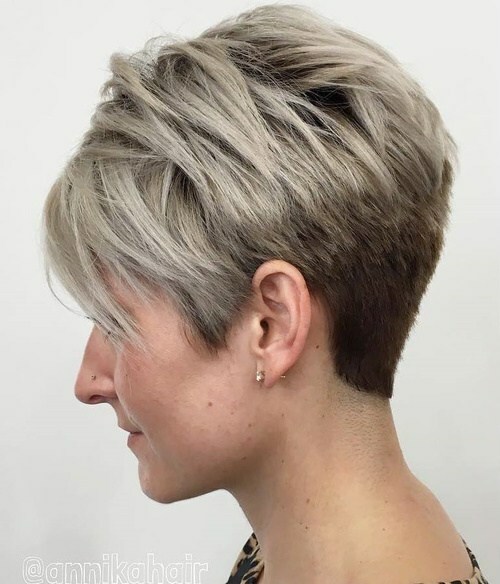 That’s the attitude that this lady has gone for and we’re certainly glad she has, because she’s got one of the most gorgeous pixie cuts we ever did see! 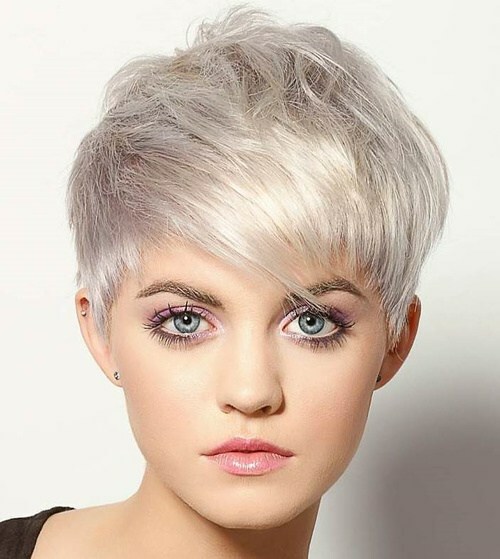 The fringe section is a striking white blonde and the back of the hair is a stunning silver; these colours work together to perfection. Ombre colouring is traditionally used for long hair, but as this wonderfully stylish lady shows, the ombre transition works equally well on a shorter hair cut too! She’s gone for a gorgeous ash blonde to chocolate brown transition, which starts from the wonderful fringe section of the hair and finishes with a close crop at the back of the head. 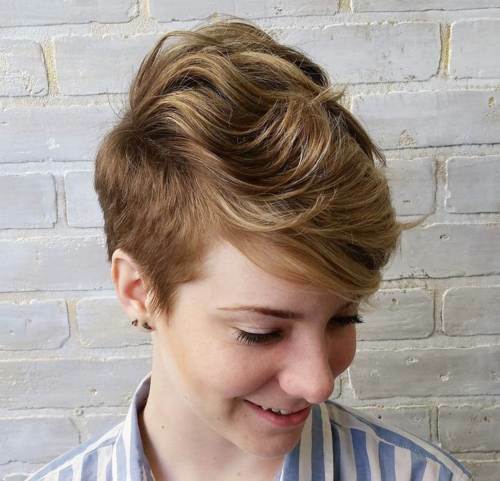 This beautiful short hairstyle is effortless to maintain, but incredibly effective and oh so stylish time after time. This stunning lady’s natural hair is a glorious and glossy brown which can be seen in the shorter sections of hair here. The bob is finished with a beautiful long fringe section which is lifted with stunning caramel toned highlights that we adore. This gorgeous pixie crop is not only fiery in nature, but fiery in colour too! 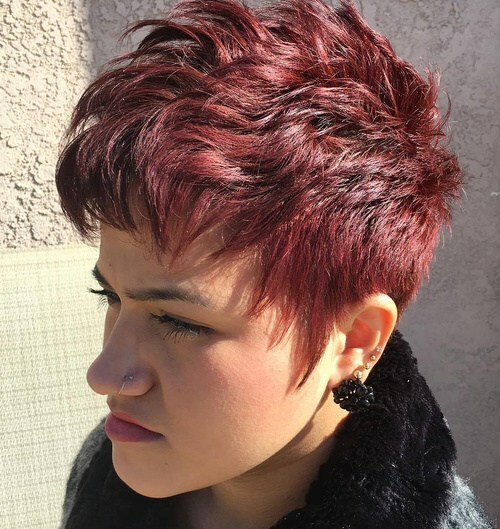 Finished in a beautiful cherry red tone, this striking hair cut is cropped short all around the face and head, and finished with a full fringe effect that frames the face to perfection. The rest of the hair is full of gorgeous, choppy layers which add bounce and texture to the hair. This beautiful and bouncy bob is absolutely beautiful – not least because of the gorgeous grey colour! It’s short on both sides but has a longer section at the top which falls into a stunning sweeping section on top and across the forehead. The glorious grey tone of her hair works perfectly with her beautiful blue eyes, don’t you think? This breathtaking bleached blonde crop has an absolutely stunning shape which is so unique – and we absolutely adore it! 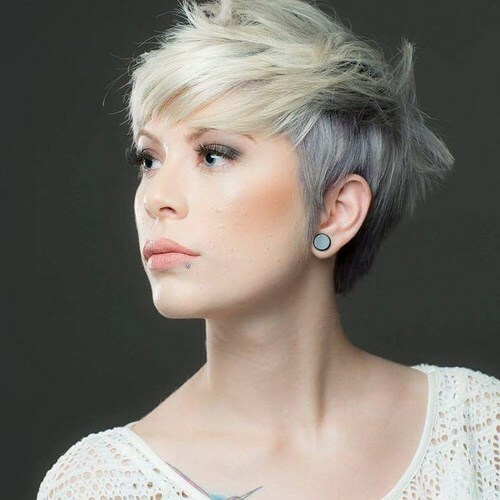 Cut closely to create a curved line for the fringe section and around the ear, the hair is finished with a lovely short cut at the back, which works towards a longer layer on top. 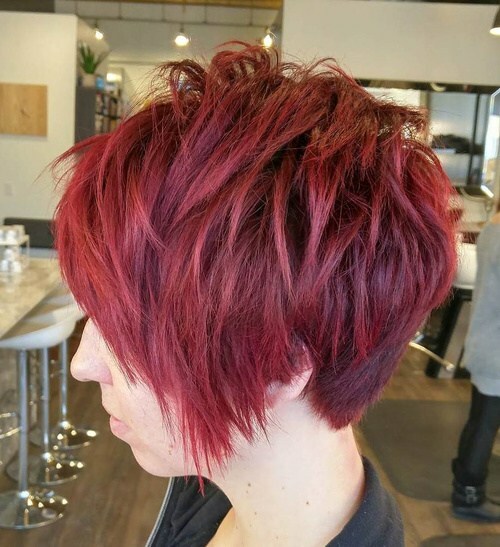 The stunning colour is the lovely cherry on top for this style! This beautiful pixie crop is shorter at the back and longer at the front, then falls into a stunning fringe section which frames this gorgeous lady’s face to perfection. As well as a lovely short crop which she’s worn straight in the picture but would be equally impressive when curly too, this amazing bob is finished with a lovely bubblegum pink colour that is so on trend. 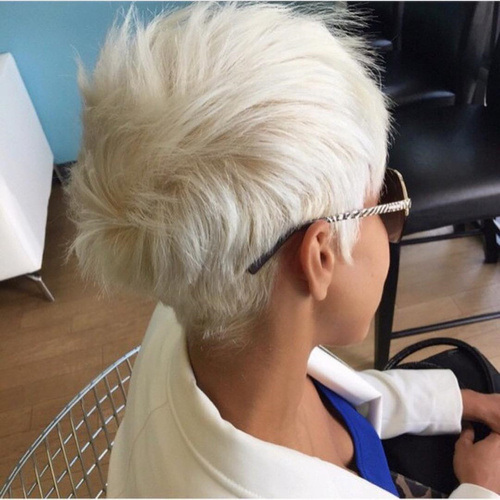 Short, spiky and striking; these are the three words we would use to describe this absolutely gorgeous pixie cut! As well as being simply beautifully cut with lots of choppy layers throughout to create a fabulous bouncy finish, this fashionable lady has opted for a beautiful bleached blonde colour to really lift the crop to the next level! 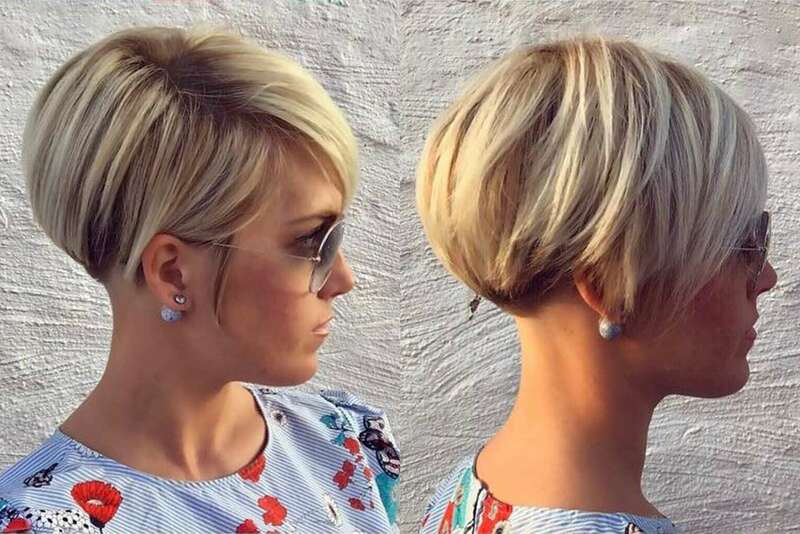 This remarkable bob is such a gorgeous style, and most definitely one of our favourite bobs from this collection of shorter hair cuts that we’ve gathered in this post. With a shaved underneath layer and then a lovely longer sweeping layer which falls into a longer fringe section, the shape of this cut is beautiful. She’s finished it with a baby blue to blonde ombre style that we adore! This lady has so many striking features about her – two particular reasons are because her two eyes are different colours which looks absolutely beautiful, and because of her striking copper cropped hair that is also guaranteed to attract attention. 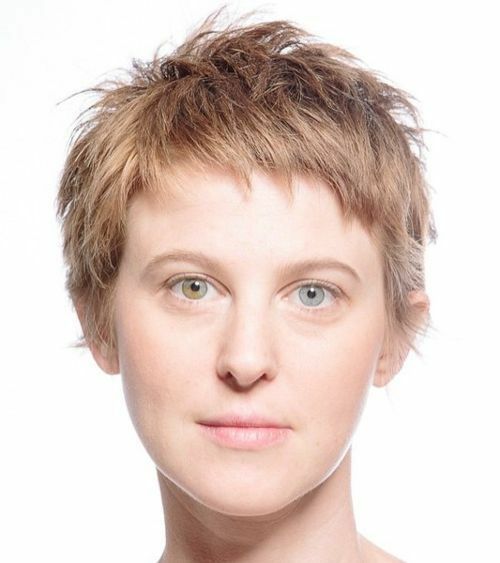 This wonderful pixie cut is short and spiky, and we think it looks absolutely stunning on her. 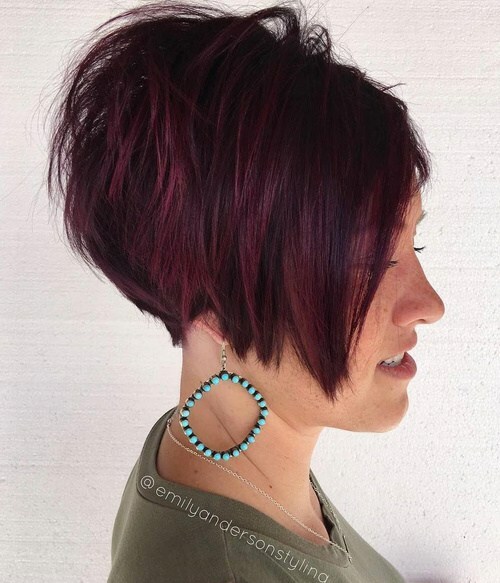 A style which has seemed incredibly popular lately is the unique bob design of a short and shaved underneath layer and a lovely longer layer on top to create an amazing juxtaposition and a totally trendy look. This stunningly blonde lady has finished the top layer off with a rough tousled look to add style and texture, and we think it looks wonderful. 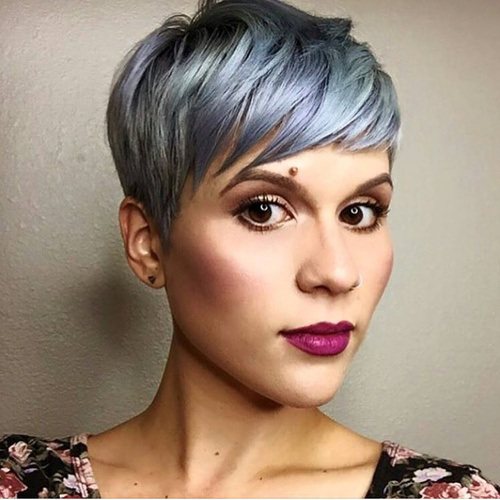 This simply breathtaking blue bob is a wonderful metallic blue colour that looks simply perfect against this lady’s gorgeous complexion! The blue brings out her amazing brown eyes, and the bob is to die for. This super short crop has a wonderful fringe section which works right across the forehead, framing her face beautifully. The finished look is the most beautiful style we ever did see! 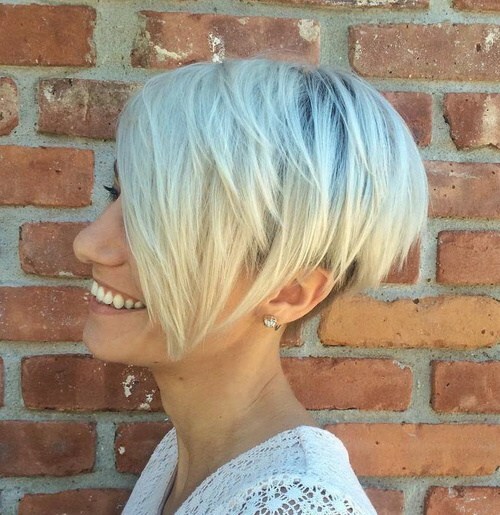 This beautiful bob is the perfect example of how a short hair style can be low maintenance but high impact, because this striking silver cut is easy to maintain but oh so beautiful looking, as we’re sure you’ll agree! To finish off this impeccable bob design which is longer at the front than at the back, this stunning lady has gone for an amazing metallic silver colour. This breathtaking bob cut with a remarkable and striking style is just guaranteed to attract attention for all the right reasons. This wonderful asymmetrical bob has a lovely long fringe section which sweeps across the face in style, and is finished with lovely choppy layers on the top of the head for a gorgeous look. We adore this ash blonde colour she’s opted for too, don’t you? A gorgeous short hair cut works equally well with straight or curly hair, as this beautiful girl has proved with her amazing brown bob! Her naturally curly hair adds a striking shape to her the close cut, which is shorter on the sides and slightly longer on top. Finished with a fringe to frame the face, she’s gone for amazing hot pink streaks to perk it up! 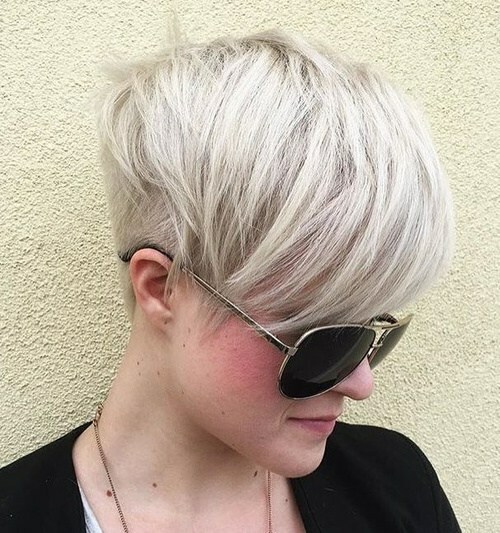 A contrast from the previous curly bob, this beautiful white blonde bob is straight, sleek and equally stylish! 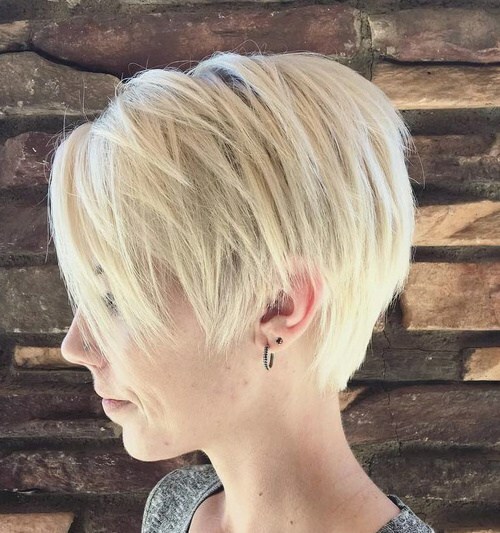 It’s finished in longer layers around the ears and with shorter sections on top, and this stunning blonde bob has a beautiful and bouncy shape which we think looks utterly breathtaking. You can add some curls for an alternative look too! When it comes to pretty shorter haircuts, the asymmetrical style is all the rage on the fashion scene as of late. 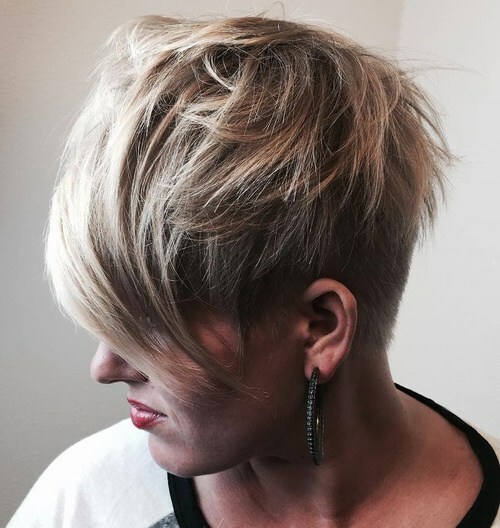 This stunning hair cut is shorter on one side of the hair, finished with lovely sharp ends for a jagged look, and a longer fringe section on the other side to create the asymmetrical finish. Working blue and grey together in an ombre look, this lady is so fashionable! 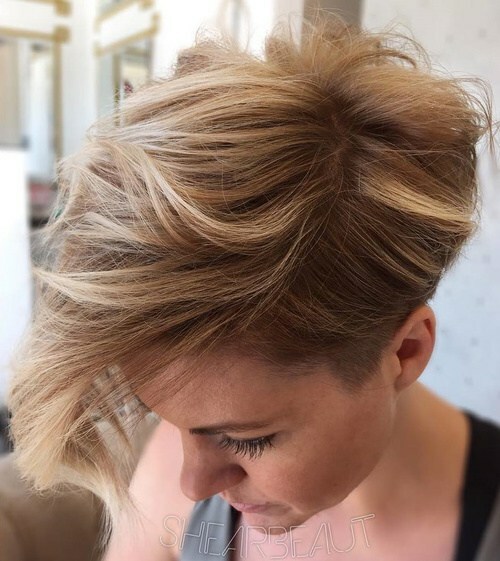 Adding some highlights into your shorter hair cut is a fabulous way to bring lift and a little personality into your cut in a truly gorgeous way; it also provides the perfect opportunity to change up your look for the new season! This beautiful copper crop is finished with lovely blonde highlights which sweep right through the long fringe and look amazing. 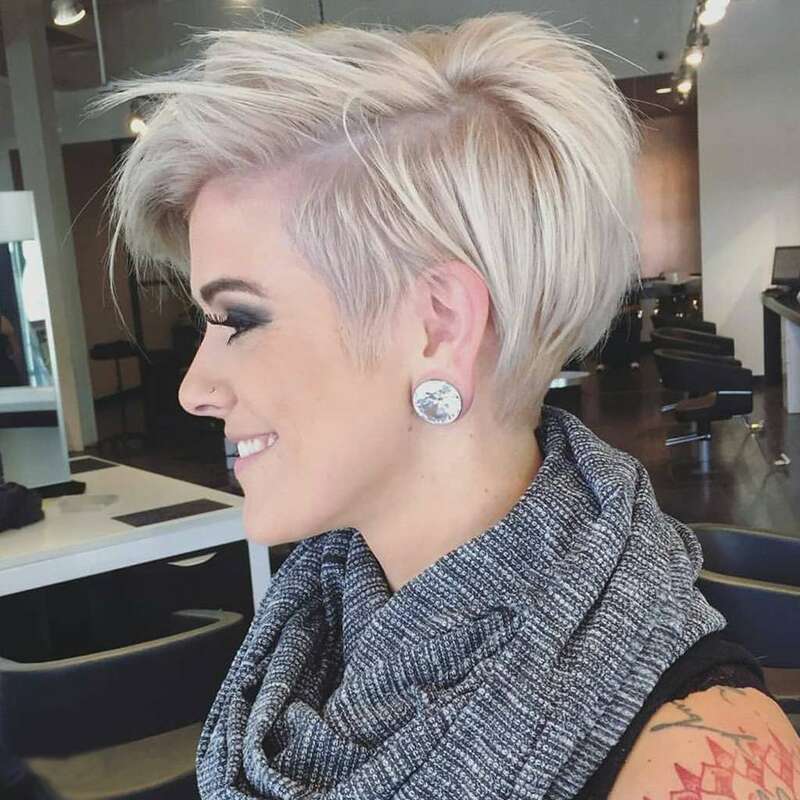 If you’d never considered cutting your hair off and opting for a shorter hair style before, then hopefully the Styles Weekly gallery of beautiful short hair cuts has inspired you to do something different this season. If a short style isn’t quite for you, there are plenty of other galleries available at Styles Weekly.